The first thing you will learn as you enter the sensational new Sharaku Exhibition currently showing at the Tokyo National Museum in Ueno is that scholars now break up the great 18th century woodblock print artist`s work into four distinct periods. The very surprising thing about this is that while most artists` PERIODS or phases last for years or decades, Sharaku went through all HIS stylistic phases within a period of only TEN MONTHS ! Yes, that`s right. ALL of the 145 extant prints which bear the signature Toshusai Sharaku (東洲斎写楽) were released to the public between the 5th month of the year Kansei 6 (1794) and the first month of Kansei 7 (1795), after having been produced at the workshops of the great Edo Period publishing impresario Tsutaya Juzaburo. In other words, his career lasted for less than a year! 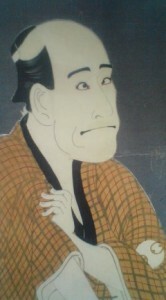 The works for which Sharaku is best known, the 28 closeup portraits of kabuki actors, which are now some of the most recognizable JAPANALLIA in existence (often seen adorning souvenir sake cups, T-shirts, postcards, etc. ), were all a part of his debut release of June 1794 ( and make up what is considered to be his FIRST PERIOD). And since nothing is really known for sure about this person SHARAKU, with no mention of him before 1794, and very little mentioned about him after his last works were released ten months later, no one is exactly sure just WHO IT WAS that created the now iconic, strikingly original and powerful works ( by which I mean the first 28 works- the rest are so disimilar in energy that they seem to have been made by a different person). For that reason, creating SHARAKU IDENTITY THEORIES has been a regular cottage industry in the world of Japanese Art History, and there have been several interesting ideas which have been put forth. The most widely accepted of these now (as attested to by a recent NHK special) is that these works were made by a Noh actor, who was apparently a neighbor of the publisher Tsutaya Juzaburo ( this does not sound very convincing to me, as the very special world of Noh, a highly refined art favored by the warrior class is so different from the world of woodblock prints and Kabuki, beloved by the Edo townsmen). A fascinating and novel theory about the creation of the works signed Sharaku has recently been proposed by the mystery writer Shimada Shoji, who has apparently been obssessed with the Sharaku question for decades. 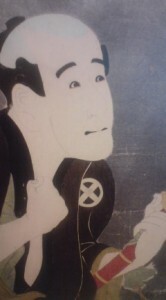 His intensive investigations have led him to believe that the Sharaku works were based on the sketches of a half-Dutch, half-Indonesian artist living at the trading post of Dejima in Nagasaki ( a tiny artificial island which was the only place that Europeans were allowed to reside within the Japanese Archipelago during the years of SAKOKU- national seclusion). 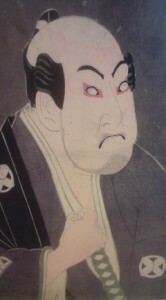 The residents of this foreign concession were required to make a journey to Edo to pay hommage to the Shogun, and Shimada-San suggests that during the short time that these foreigners were in Edo, that Tsutaya Juzaburo arranged for them to secretly meet ( under penalty of death to all involved!) 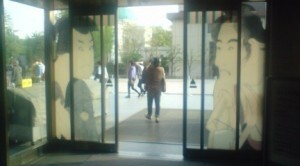 Kabuki actors, sumo wrestlers, etc, characters that otherwise they would not have been able to see. At this meeting ( or meetings) the foreign artist would have been able to make numerous sketches which later could have been developed in prints by Tsutaya`s staff at the woodblock print workshop. That would explain why the work were so different from anything the Japanese had ever produced before. A very interesting theory ( one I hope scholars will seriously look into), though not mentioned AT ALL at the National Museum`s Exhibition . In fact, there is no discussion at all there of Sharaku`s identity there. What they do have at the current exhibition is almost ALL of Sharaku`s known oeuvre ( with the exception of a couple which due to the earthquake of March 11th could not make it to the show), as well as numerous works by Sharaku`s contemporaries, which after comparison, help to show just how special some of the Sharaku`s works are ( while in fact most of the works which bear the Sharaku name are just plain boring). 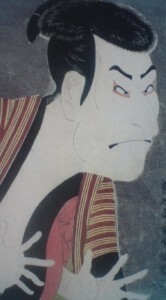 The best of these works ( the close-ups of the Kabuki actors) stand out as being truly distintive, with their special attention to gesture and facial expression ( especially in the eyes and mouths). The artist even took care to include the wrinkles on his subjects foreheads ( something unheard of at the time). These most powerful of Sharaku`s works must have been what led the German art historian Julius Kurt ( more than 100 years ago) to rank Sharaku as being one of the three great portrait artists in world history, along with Rembtandt and Velazquez! To tell the truth, it might be because of this recognition and appreciation by a respected foreigner that Sharaku`s works have been given special attention in Japan. That and the mystery! Spending a few hours examining the works at this amazingly comprehensive exhibition was indeed enjoyable for me ( as the exhibitions at that museum usually are). A few of the works were truly vibrating with life. Still I cannot agree with Kurt in saying that Sharaku`s works are great portraits, or even great art ( they were in fact printed and sold to fans of the kabuki stars in the same way that photoos of TARENTO ( tv stars) are sold today at stalls in Harajuku). The works seem more significant to me for the history of pop culture and the later development of manga (comics) in Japan. They are certainly great charicature. Well, who cares what I think! Go check it out for yourself. It will be on until June 15th. And as you can imagine, the souvenir shop has lots of great Sharaku motifed goods! Great presents for friends and relatives back home. Cheezy Japanallia! 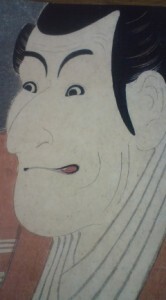 I hope to go to the Sharaku Exhibition. He drew well to capture their unique characteristics. I think he was also used color well. I have started taking pictures. To take pictures is to observe things. It is useful for me to look at Syaraku’s works.